Whether you are viewing this website while you are in Lavallette or are somewhere else thinking about your next visit to the Jersey shore, you have come to the right place to find the information you need to help you enjoy your beach vacation. Lavallette is one of the nicest beach communities on the Barnegat Peninsula. You enjoy ready access to the ocean beach and the Barnegat Bay shoreline from here and there are also plenty of places to eat and shop in town. Seaside Heights, Point Pleasant, and Toms River are but a short drive away yet they are far enough away that you feel far removed from these busier shore areas while you are in Lavallette. You can use the navigation tabs above or to the right to jump to a page with more detailed information about specific topics or you can continue to scroll down this page to get an overview of some of what Lavallette has to offer. There is an ocean beach and two bay beaches that are protected by lifeguards during the summer. Each beach requires you to be wearing a beach badge when the lifeguards are present. You can find out about when the lifeguards are working and all about beach badges here. There are three motels in Lavallette and plenty of rental homes (and realtors!). 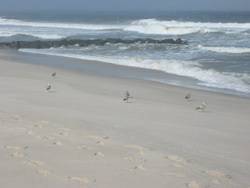 Lavallette is located on the Barnegat Peninsula in Ocean County, New Jersey. The town is less than a square mile in area and has less than 3,000 permanent residents. The short stretch of Route 35 south running through Lavallette contains stores, places to eat, and a variety of services. If the New Jersey monthly magazine is to be believed most residents should love living here. 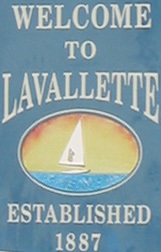 The magazine's 2008 survey listed Lavallette as the eight best place to live in New Jersey. From Memorial Day until Labor Day the summer tourists flood into town, outnumbering local residents many times over. There is a lot to like about the summer time in Lavallette. 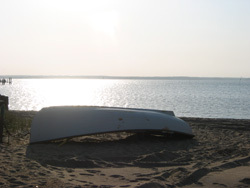 In addition to the beaches there a few nice restaurants, a yacht club, and numerous places where you can fish from the shore of Barnegat Bay or surf fish in the Atlantic Ocean.